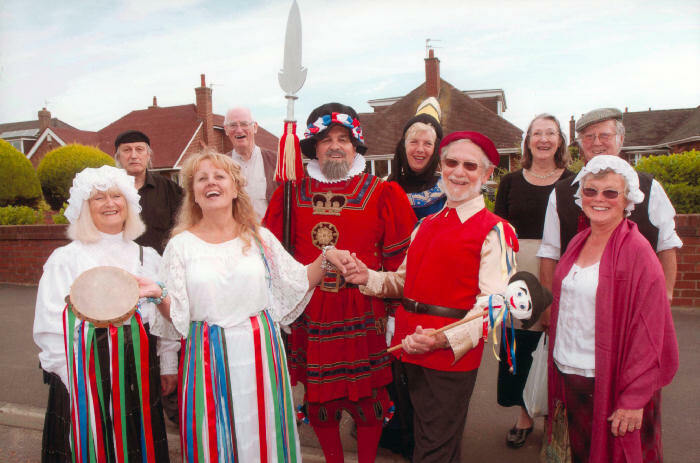 On 19th June 2004, the Society presented Gilbert & Sullivan’s Trial by Jury in Lytham Edwardian Magistrates Court (1902). It was delightfully performed by Marton Operatic Society and an excellent buffet supper followed in the nearby Hewitt Room, provided by Rowley’s catering. Tickets were limited to 50, at a cost of £25 each, and all who watched or participated felt they had had a truly memorable evening. 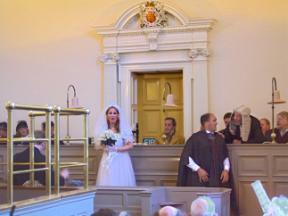 The singers occupied the Bench and the Dock and we borrowed a full wig from a local judge. 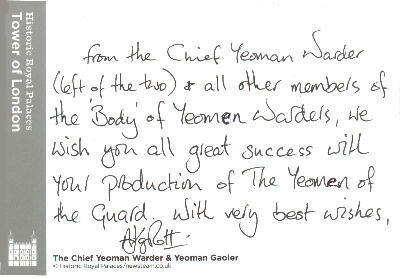 Our thanks go to Ken Dagger and Marton Operatic Society, to the Lancashire Police for allowing us to hold the event, and to Fylde Borough Council for waiving their fee for a licence and helping with regulations. On 16 July 2005 we celebrated our 75th Anniversary with a dinner and dance at the Sheraton Hotel in Blackpool. Many past and present members and friends were there, across all the generations. Here are some of them. On 6 August 2006 we gave a concert in Stanley Park as part of the Park's Summer Series. This is now an annual event. We have supported BBC Children In Need by giving special marathon concerts. Each time we have sung sponsored items from each of the Gilbert & Sullivan works in chronological order. And to start the 2008 concert we sang "Climbing over rocky mountain" - from Thespis! The music for this, the first G&S collaboration in 1871, is lost but we have the libretto; and as the words are almost (but not quite) identical to those in the item from The Pirates of Penzance it's pretty safe to assume Sullivan used the same tune. There were one or two unusual items in our 2009 concert as well - this was the programme. And here are the photo highlights. 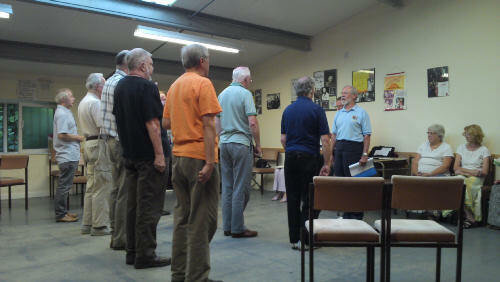 LEFT: Dad's Army - er, I mean - the 35th Dragoon Guards in rehearsal for Patience recently. Don't panic! We'll pick up the routines eventually. 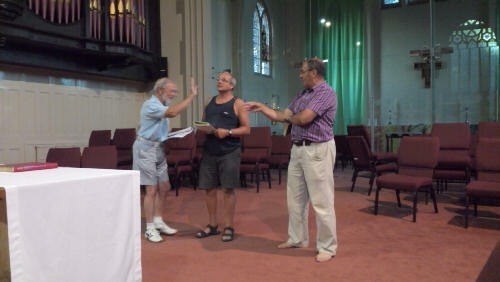 RIGHT: A sticky moment in rehearsals as Ken runs through the toffee dialogue with John and Philip. The original production was “under the personal direction of the Author and Composer”, at the Opera Comique from 23 April to 8 October 1881 (170 performances). Except on the opening night, the opera was preceded at 8 pm by a Vaudeville production written by Frank Deprez with music by Alfred Cellier entitled In the Sulks. Then Patience followed at 8.45. The opera was transferred to the Savoy for the opening of that theatre on 10 October 1881. There it ran for a further 408 performances until 22 November 1882. The total of 578 was the longest run of any G&S opera apart from The Mikado. The first performance at each theatre was conducted by the Composer and thereafter by Francois Cellier, Alfred’s younger brother. The Scenery was by John O’Connor. The aesthetic dresses were designed by the Author and executed by Miss Fisher. Other dresses were by Mr Nathan, Messrs. G. Hobson & Co and Madame Auguste. 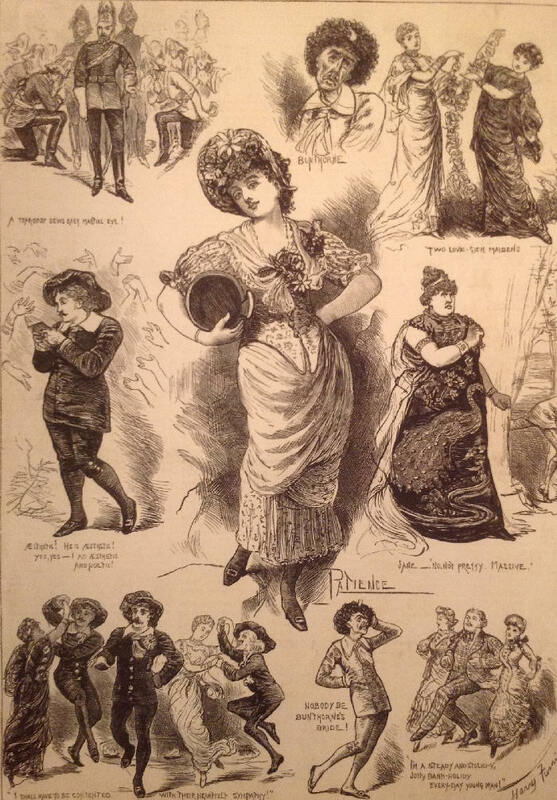 Patience first went on tour with the D’Oyly Carte Opera Company from 1 August 1881. The opera was first performed in Blackpool on 31 October that year for three nights. Marton Operatic Society first presented the opera at Marton Parish Hall from Monday 15 to Saturday 20 November 1954. Our life member Isabel Fenton (Straughton) was Patience. Her Mother and Father (Jennifer North and George Straughton) toured with the D’Oyly Carte “New” Company and appeared in Patience at Blackpool in December 1925. Top row L - R: Durward Lely (real name James Durward Lyall) as The Duke of Dunstable; George Grossmith as Bunthorne; Two Maidens of the Chorus. Centre row L- R: Rutland Barrington (real name George Rutland Fleet) as Grosvenor; Leonora Braham (real name Leonora Lucy Abraham) as Patience; Alice Barnett as Lady Jane. Bottom row L - R: Richard Temple (real name Richard Cobb) as Colonel Calverley, Durward Lely as The Duke of Dunstable and Frank Thornton as Major Murgatroyd with Jessie Bond as Angela and Julia Gwynne (real name Julia Putney) as Saphir; George Grossmith as Bunthorne; Rutland Barrington as Grosvenor with two ladies of the chorus. Harry Furniss was born in Wexford, Ireland. He worked as an artist in Ireland but in 1876 he moved to England and found work with the Illustrated London News. Over the next eight years, he developed a reputation as an outstanding draughtsman. His most famous humorous drawings were published in Punch, for which he started working in 1880, and to which he contributed over 2,600 drawings. He left Punch in 1894 when its owners discovered that he had sold one of his 'Punch' drawings to Pears Soap for use in an advertising campaign. Furniss's work became extremely popular with the public and he toured the country giving lectures on subjects such as The Frightfulness of Humour and Humours of Parliament. He illustrated many books including those by Lewis Carroll, Dickens and Thackeray. The Punch cartoon on the right says "I used your soap two years ago and have not used any other since". Furniss is parodying Thomas J Barratt's adverts for Pears Soap . 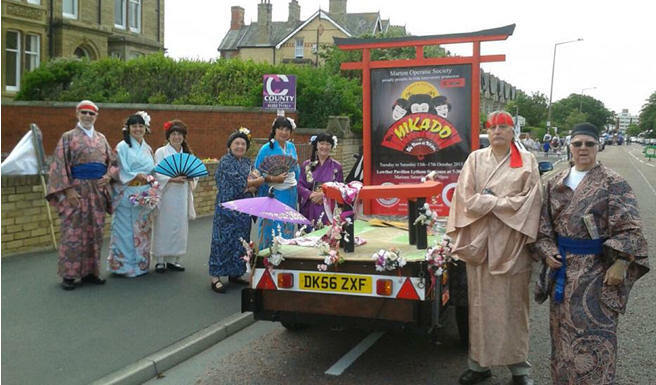 And here we are at St Annes in July 2015, where our float and costumes for The Mikado won Second Prize. 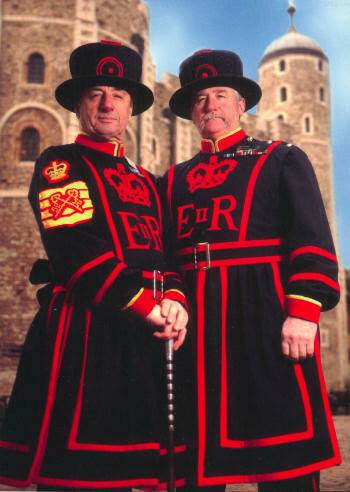 A recent article by a former member in our newsletter the Palace Peeper brought back memories of the Youth Theatre which did Gilbert & Sullivan productions - and not just of the popular ones either. 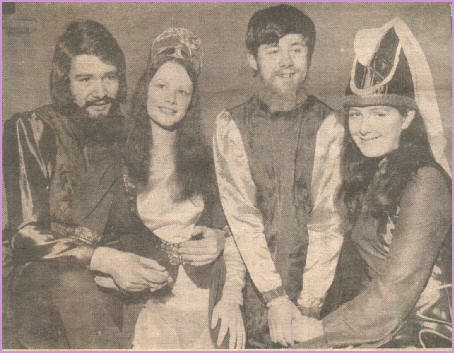 Here is a group of them ready to tread the boards for Princess Ida in 1966. Nearly 70 of us gathered at the Bedford Hotel in St Annes for a celebratory dinner and dance. Three awards for long and distinguished service were made. Details are on our Awards Page. Here are some more photos. Once again we paraded for our forthcoming show. 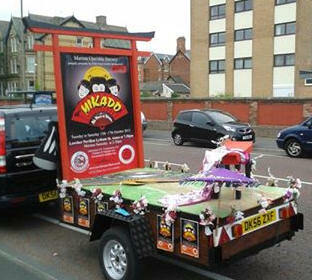 Despite the weather we came second in the Clubs and Associations section of the Carnival. Really pleased to be part of these happy gatherings. 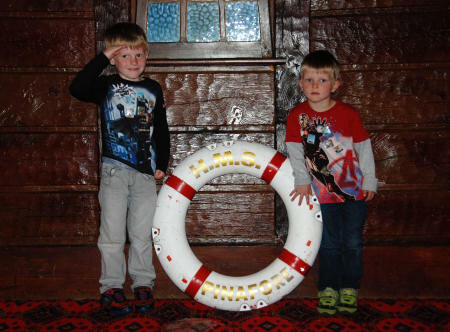 As our show approaches, our photographers' grandchildren get in on the act!